The most important medical research article published for over 100 years ! If you are a doctor and whatever be your specialty . . . if you do not read this article and understand the nuances probably you will not become a complete medical professional ! 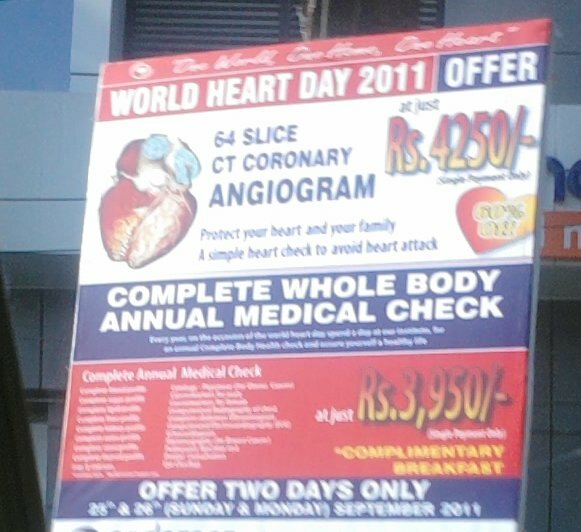 While BMJ struggles to propagate a vital truth , this banner on a Indian high way tempted the public to go for 64 slice CT scan . . .just like that ! Accruing medical knowledge and skills is only one aspect of medical profession. Applying it properly in our patient population is entirely different ball game . Let us be disease curers and not disease hunters . This is important because disease hunting is a dangerous game , where victims can be innocent bystanders. This is exactly same thing Hippocrates refered to as Primum non nocere 1000 years ago. It has required a huge statistical study to RE-INVENT this universal fact !